The moment bitter gourd is mentioned, most people wrinkle their noses and twist their taste buds, as if they can actually feel the bitterness. The bitter truth is, this vegetable is so chock-full of benefits for overall health, it is unbelievable. So avoid it at your own risk. Bitter gourd is my personal favorite vegetable. I have fond childhood memories of waiting and watching for the flower on our creepers to shrivel and give way to the young karela, just so I could pluck and eat it. We had this little patch of soil in our backyard where we grew bitter gourd, beans, tomatoes, and curry leaves. The bitter gourd creeper grew all the way up, across our roof and one fine day, appeared above our front door! I remember climbing the roof with my uncle and harvesting the bitter gourd in small buckets. Then we’d distribute it in the neighborhood. With the produce we kept for ourselves, a number of dishes would be made. Curry, Sambar, Sliced, flavored and dried to be fried and savored later, pickled, and so much more! Of course, most people prefer karela/bitter gourd deep-fried–but that’s really not the best way to reap its benefits. We generally cook it as a dry curry, or in gravy. Either way, our family enjoys it. As a diabetic, salads are a mandatory part of my diet. I love salads and am always looking for variations and variety. When my classmate suggested the salad recipe I am about to share here, I was delighted. I like eating it raw, but this sounded just delicious. She assured me I would fall in love with it and also told me her son loves to make a big batch when he’s home on a break and carry it to college. Well, I now make this regularly and thoroughly enjoy it. I mean, absolute win-win situation for me. And my blood sugar. 2. Scoop out the insides, cut in strips and chop finely. 4. 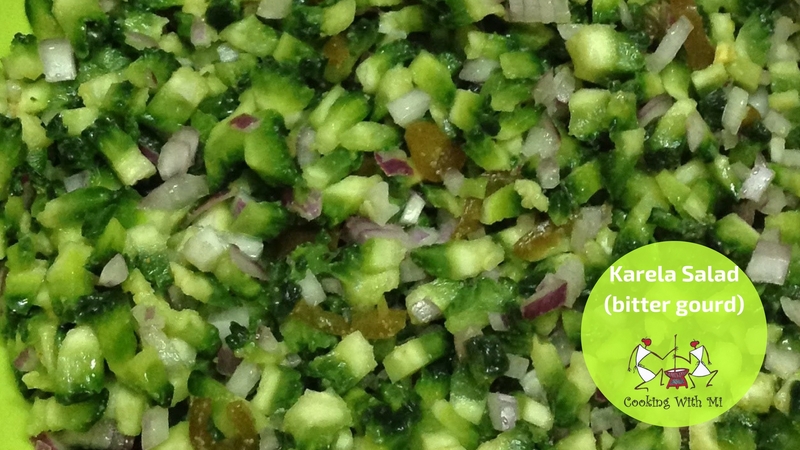 In a bowl, add the chopped karela, onion, chili. Make a big batch and pack off half into the fridge. It will taste even better since the karela gets time to marinate in the lemon juice. No lemon juice? I sometimes splash some apple cider vinegar. My blood sugar says thanks. Salt is not mandatory, I find that it tastes fine without it, too. I substitute green chili with jalapenos. Tastes fabulous. Do you like bitter gourd? Would you try this salad? I prepare karela as a sabzi with less oil. And we all relish it. But karela raw salad is something new to me. I will try it.